Surprise! There's a new iPad out. Again. Already. But should you ditch the one you've got for the new guy? Our guess is probably not. Where to start! There's that speedy new A6X chip, for one thing. That's a genuine improvement over the new iPad of this past March. The A6 that it's based on improved the iPhone's performance and power consumption. That's a pretty rare trick, although the new iPad's 10 hour battery life doesn't reflect that same kind of improvement. In fact, it's the same as iPad 3. But how does the A6X compare in terms of performance with the iPad 2's A5 processor and the iPad 3's (shut up, we're using 3 and 4, it's just easier to keep track that way) A5X? While the A6X is apparently a big improvement (twice as fast! ), remember that Apple still considers the A5 good enough to use day-to-day, because it's using the die-shrunk version of the A5 (which has slightly better battery life) in the new iPad Mini. But the Mini is smaller—doesn't that matter? Nope! Both tablets are the same resolution—1024x768—and have the same 786,432 pixels to push. (Both also, probably, have 512MB of RAM.) It's the same workload. The other addition is the Lightning connector, which is a big deal for future-proofing yourself, obviously, but iPad accessories aren't quite at the same level as iPod and iPhone accessories. And most of your interaction with peripherals on an iPad is going to be wireless, anyway. Think about it: what accessories for an iPad actually use the dock connector? There's nothing out there that's going to force you into Lightning any time soon. So an iPad 2 is still more than capable. An original iPad lags a little further behind, since it's missing some key AirPlay functionality and a camera, and was considered sluggish even by the time the iPad 2 came out. But if you've held out this long, there's good reason to hold out just one more generation. Here's the thing: The iPad is in a weird cycle right now, especially compared to every other Apple product. Starting with the retina MacBook Pro at WWDC, Apple's spent the past five months in a relentless drive toward impossibly thin and light gadgets. Those MacBooks, the iPhone 5, the new iMacs, and especially the new iPad Mini—all of them represent a massive reduction in size from their previous iterations. And then there's the iPad. Unlike the rest of Apple's stuff, March's upgrade made the iPad 3 thicker, heavier, and hotter than the iPad 2. It was a totally un-Apple progression, made even sillier by the cavalcade of coke-habit-thin gadgets that came after it. This new iPad is just as big (same dimensions), and actually ever so slightly heavier (by 0.01 pounds, according to Apple's official specs). But if the assembly of those products is anything to go by, there's zero reason to think this trend of fat iPads is going to continue. Watch this iPad Mini assembly video, starting around 3:10. Does that engineering process and display assembly look familiar? It should. It's dead-on similar to how Apple put together the iPhone 5, which was thin and light enough to make people actually complain about those objectively wonderful traits. Compile that with the inclusion of thinner, lighter Igzo (and similar) screens, and reason stands that a similar process has to be coming to the iPad next go-round, and it's going to be a hell of a lot more impressive than a new processor and a Lightning connector. In other words: there's nothing here that you can't live without for 12 months. So Don't Buy This at All? 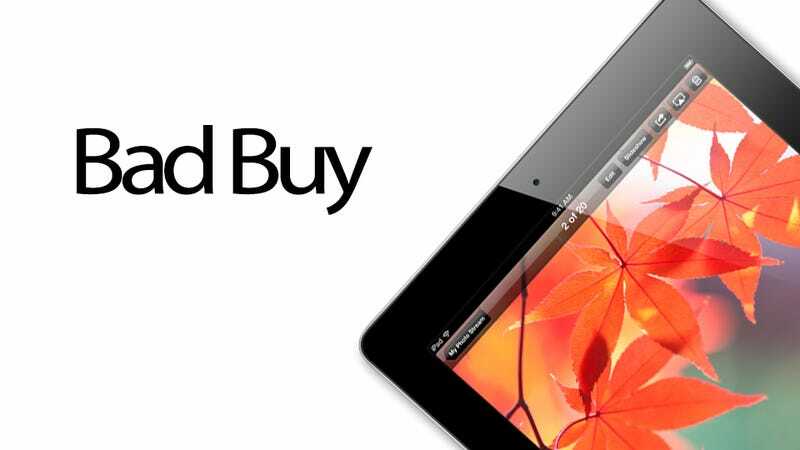 Obviously, if you're buying someone a present, it makes the most sense to get this newest iPad. The Lightning connector alone makes getting anything else nuts, since all of yourApple accessories going forward will use that new connector. The retina display really is pretty great, too. If you're starting from scratch, iPad-wise, buy with confidence. If not, though, remember that these past two iPads have the kind of design compromises that other current Apple stuff just don't suffer from. And the kind that are especially troubling for a gadget that's so visceral. So if you can hold on one more refresh cycle, all signs point to the larger-than-typical payoff being a super thin spaceship of an iPad next year. You've been warned.